The Athens Festival takes place at a number of venues, including the magnificent Herod Atticus Odeon, which dates back to 161 AD. The ancient, tiered theatre nestles at the foot of the Acropolis. The festival runs through summer and autumn, and graces audiences with marvellous symphony orchestras, classical drama and dance, and operatic performances. 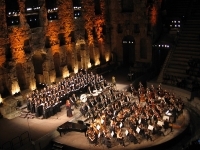 The large and varied programme features Greek and international artists. Travellers can catch the festival's summer section during June and July, and the autumn section during August and October.